My daughter is now a freshman in high school. I still can’t believe it. We had a great time at the Champlain Valley Fair, northern Vermont’s end-of-summer bash. More writing time, now that the kids are back in school! Whoo hoo! I’ve been enjoying updating the maps of my fictional world of Alltyyr. Going back over them has given me the opportunity to delve once more into the varied geographies and histories of its lands and peoples. 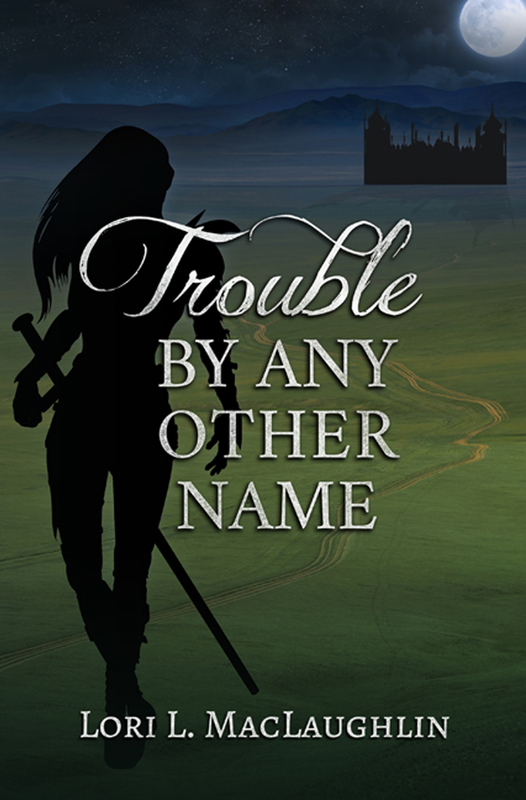 Book I: Lady, Thy Name Is Trouble takes place in the Western Kingdoms of Alltyyr. Eight kingdoms comprise this part of the realm: Barony, Faragellyn, Dhanarra, Sulledor, Mardainn, Jendairin, Tralyxa, and Clair. Barony, the northernmost kingdom, boasts wide vistas of rolling grasslands where horse breeders raise all manner of horses from war mounts to swift thoroughbreds to palfreys for court ladies. Its cavalry is unmatched. Renowned for their training skills, Barony’s horsemen are as much in demand as their incomparable horseflesh. Barony is also well-known for its brandy distilleries located in the capital city of Cierra. Cierran brandy commands an exorbitantly high price. Barony is bordered on the east and north by the dense, wild forest of Shallin Wood, and on the west by the much tamer timberland of Devrin Wood. Southeast of Barony lies Faragellyn. Half farmland, half forest (the primordial Shallin Wood), Faragellyn grows crops and beef for trade. Faragellyn’s capital, Crystalir, was once the seat of the kingdoms’ High King, chosen to unite the kingdoms centuries ago in the aftermath of the war between the West and the Eastern Frontier. After the High King’s line died out, the kingdoms squabbled and dissolved their alliances, and an ancestor of the current king of Faragellyn, Jacques du Mraine, rose to power. The House of du Mraine has ruled Faragellyn since that time. West of Faragellyn and south of Barony sits Dhanarra. Rich farmland covers the upper two-thirds of this powerful kingdom — powerful because it controls a large section of the Amberin River, a vital trade route that flows from north to south the entire length of the kingdom. The southern third of the kingdom encompasses the foothills of the Scarlet Mountains, an area of rough terrain inhabited by sheep and goat herders. Carilon, the Dhanarran capital, is highly regarded for its academics, both in traditional education and, for those with aptitude, training in the use of magic. West of Dhanarra and southwest of Barony lies Sulledor. This rocky, forested kingdom contained mostly within the expanse of Devrin Wood, relies mainly on timber and the fur trade for its sustenance. Sulledor is ruled by a brutal dictator with a restive army. Neighboring kingdoms keep a wary eye on their activities. Went to a classic car show this past weekend and enjoyed seeing all the antique autos and muscle cars. Finally had time to go through my kids’ closets and pull out everything that doesn’t fit anymore. We ended up with two garbage bags full of clothes to donate to Goodwill. Now we get to go school clothes shopping this weekend. 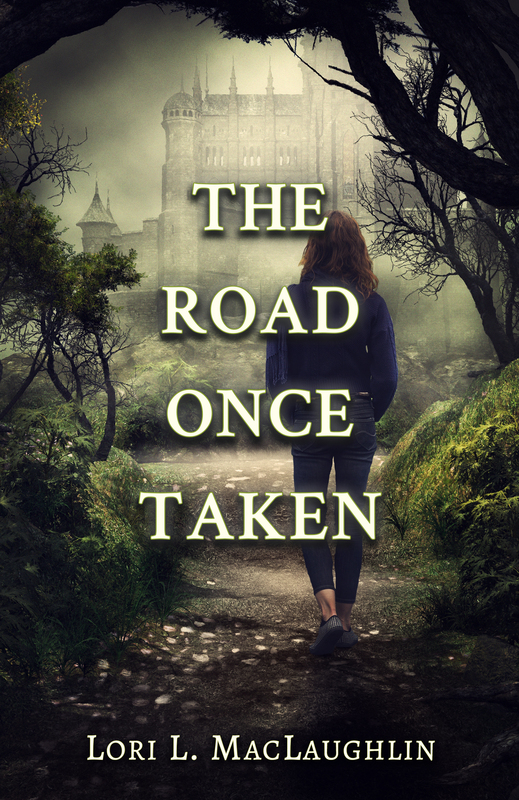 Loni Townsend recently posted a new book trailer over at her blog, Squirrel Talk. 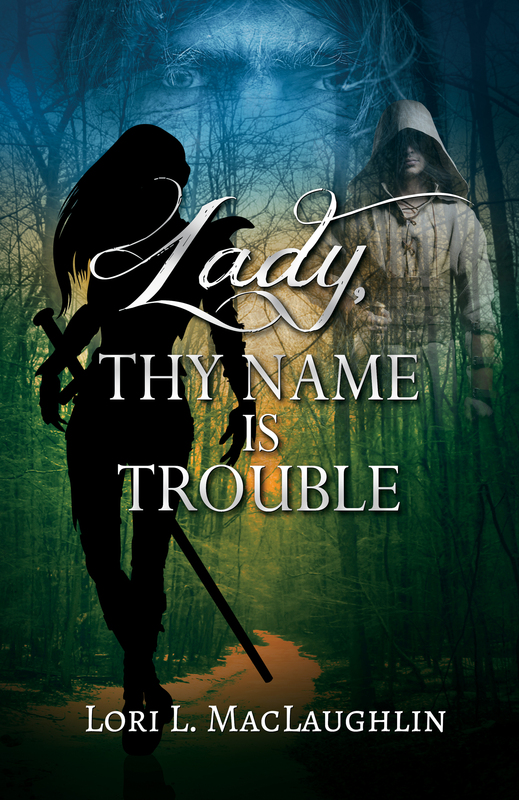 The trailer is for her novel, Thanmir War, now available on Amazon. She’d love some feedback, so if you’d like to tell her what you think, click here and leave her a comment. Click full screen for it to play. Thanks and enjoy! We replaced our aging, rusting-out, mechanically-challenged minivan with a new (to us) vehicle. It’s nice to have a reliable mode of transportation again. I’m actually getting my blog posts out on time this week. I love maps. Whenever I pick up a new fantasy novel to read, the first thing I do is look to see if there’s a map of the fictional world I’m about to enter. Maps of these imaginary worlds are so much fun to study — the rise and flow of the landforms and bodies of water, the boundaries of the kingdoms, and the placement of cities and towns. And the names — that’s what I enjoy the most, reading all the names and getting a feel for how they sound and what kind of images those sounds evoke in my mind. It doesn’t matter if they’re everyday words or if they’re exotic or fantastical. Any name can spark my imagination. Drawing maps is even more fun. Before I started writing my first novel, I had already drawn maps of the world my characters inhabited, and rough sketches of some of the important places. From these beginnings, my stories build, my characters living day to day in a paper land that’s so real in my mind’s eye. I’ve always found it easier to have that visual when trying to figure out the timing and spatial aspects of a story, like how long it would take this person to travel here versus this group traveling there, and questions of that sort. It makes everything seem more concrete to me. I refer to my maps all the time when I’m writing, just as I regularly flip back to the maps I find in fantasy novels, to better follow the characters’ progressions through the story. I’ve been putting the finishing touches on the map that goes with my soon-to-be-published book. I tweaked a few of the names of the towns and kingdoms to make them more unique, and changed a couple of them entirely when I discovered the names had already been used on other maps in other books, or had previous proprietary claims (such as the kingdom name I “created” which turned out to be the same as a trademarked drug belonging to a pharmaceutical company). When I first drew this map back in the mid-1980s, I never thought about whether anyone else had used the names before. Now, I do Internet searches on every name, for both places and people, to try to avoid inadvertent conflicts. But since I’ll never be able to read every book ever published or every map or character name from every online gaming world out there, I know it’s impossible to avoid all duplication. I try, though, unless it’s a common name or household word, in which case it’s not as important. I can’t wait until the day I see my map spread out in the front pages of my own book. Soon. After a stressful week of car problems and being under the weather, I received a delightful pick-me-up from amazing blogger Sue Archer from Doorway Between Worlds. She nominated me for the Wonderful Team Member Readership Award! Thanks very much, Sue! I’m honored to be included. The Readership Award salutes bloggers who regularly visit and leave thoughtful comments on other blogs in support of the blogosphere community. I particularly appreciate this award right now as I’ve been lamenting not being able to do much reading or blogging lately because of time constraints and the general craziness that so often crops up in life. I very much enjoy my interactions with people in the comments of so many blogs. For me, it’s the best part of blogging, and it’s great to know that my commenting makes a difference to others. I know it makes my day when people comment on my posts. I’d like to give a huge “thank you!” shout out to everyone who has visited, commented on, or liked my blog. I really appreciate it! One of the rules for accepting this award is to finish the sentence: A great reader is… To me, a great reader is one who reads everything enthusiastically and with a positive attitude, one who takes the time to mull over what s/he read and leave a meaningful and supportive comment that encourages the writer to keep going. A great reader is an integral part of the community that makes the blogging world go round. Caffe Maggieato, who I met first through the Insecure Writer’s Support Group and then through Celebrate the Small Things Friday blog hop, regularly stops by with good cheer and encouragement. I find Maggie’s blog title inspirational — Just Get It Written. Thank you for all the support you give to me and to all writers! Loni Townsend over at Squirrel Talk, another IWSG member, has given me some great suggestions and advice, along with useful links that broadened my knowledge of fonts. Thanks so much for sharing! Heather McCubbin, who I’ve enjoyed conversing with over our writing processes, is also an IWSG member. 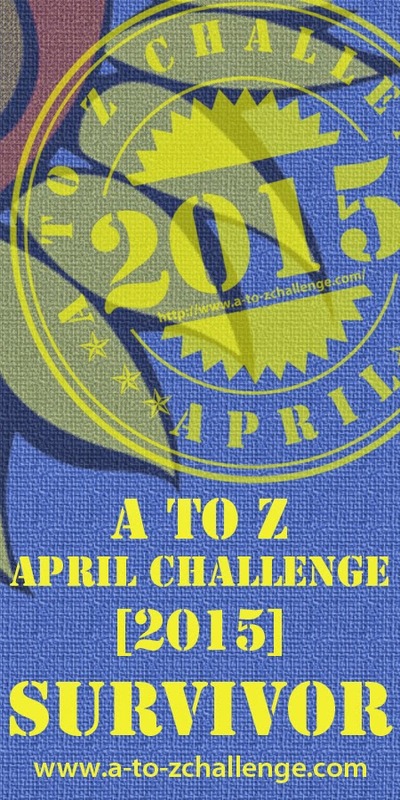 She is an aspiring writer, like me, and writes about her journey on her blog, Pushing the Pen. Thanks for the support and encouragement! Mishka Jenkins, who blogs at A Writer’s Life for Me, is another writer who stops by quite often like a friendly neighbor. Her comments are like a warm smile and a wave from a comrade. I appreciate your taking the time to visit! 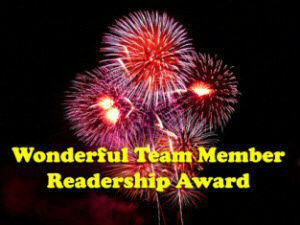 The Nominee of the Wonderful Team Member Readership Award shall display the logo on his/her post/page and/or sidebar. The Nominee shall nominate 14 readers they appreciate over a period of 7 days (1 week) – this can be done at any rate during the week. It can be ALL on one day or a few on one day and a few on another day, etc. The Nominee shall make these rules, or amended rules keeping to the spirit of the Wonderful Team Member Readership Award, known to each reader s/he nominates. Thanks again, Sue, for nominating me for this award!